Sited among towering 200 year old Native Palms, Live Oaks, and native Magnolia overlooking to the Southeast the vast and protected Guana River Watershed this unique 5BR/4BA home is a nature lovers paradise. The backyard, featuring a crystal pool, tropical gardens, gazebo And the amazing recent West Wing addition for beautiful sunrises and entertaining evenings of Grilling, cocktails & relaxation. 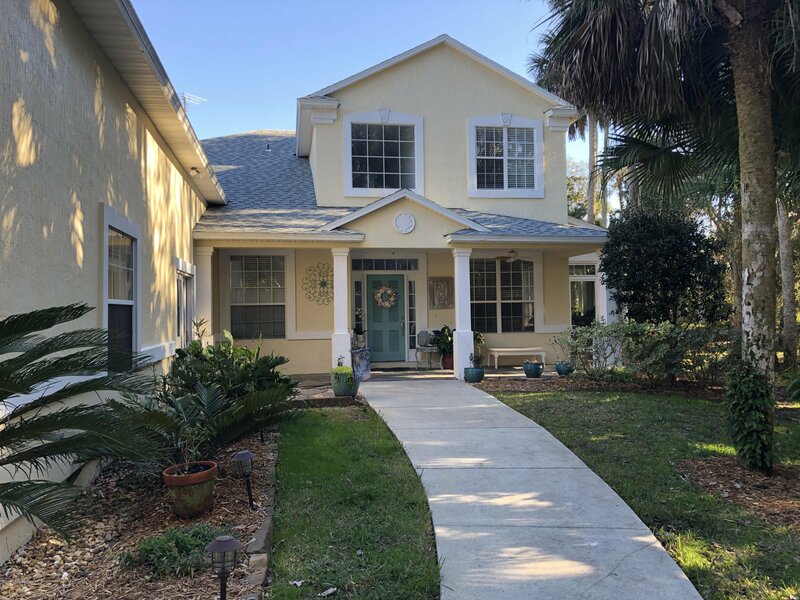 Inside, the gracious foyer leads to an open Greatroom & kitchen that boasts updated flooring, a large island, drop in Induction 5 Burner Cook top with built in oven & generous casual dining area. The quietly tucked away MBR/BA suite offers special views of the tranquil preserve & a new seamless shower. Please continue reading... Upstairs has 3 sizeable BRs and lovely bathroom with alluring views of the sunrise. Also upstairs, a huge bonus room ideal for teens, office, gym, and more. Another bonus to this house is a fabulous oversized 2-car garage fully air-conditioned. Storage cabinets galore, workbench, shelving and much more! Plus, a generous untiilty room makes laundry chores almost a pleasure. This gem of a home has so many details: a NEW roof, SS industrial stove vent, cool circular walk-in shower, healthy farm-to-table botanical gardens, triple crown molding, wood-burning fireplace, all in a secluded, gated enclave of only 47 homes. Seller to provide One-Year Home Service Warranty to Qualified Buyer upon accepted offer. Location is within walking distance to Micklers for easy beach access & close to the highly coveted St. Johns County school system.